I’ll be honest with you, I’m sick of writing about death. If the recent loss of Satoshi Kon to cancer wasn’t enough, then anime was struck another blow last week with the death of Umanosuke Iida to the dreaded disease at just 49. Despite this relatively young age Iida had an impressively varied career, from working as an animator on such classics as Nausicaa through to directing Mobile Suit Gundam: 08th MS Team and perhaps his most popular show Hellsing. 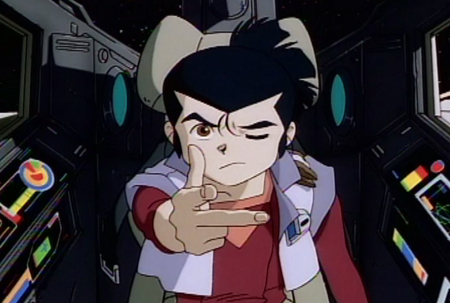 But for me he’ll always be remembered for directing the obscure, and sadly unfinished, 90s science fiction OVA Mighty Space Miners. 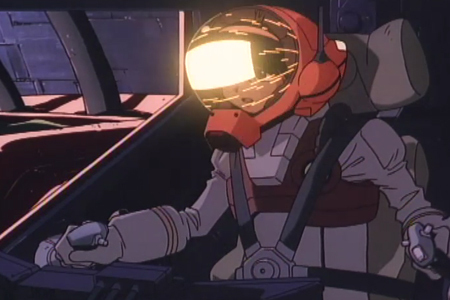 MSM is yet another example of anime’s obsession with space colonisation, and in particular the vision of orbital colonies outlined by pioneering NASA scientist Gerald O’Neill in his book The High Frontier. 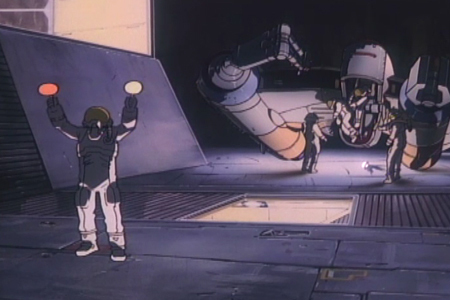 The designs and ideas outlined by O’Neill were clear influences on everything from Mobile Suit Gundam through to Cowboy Bebop, and MSM is no exception with it’s portrayal of struggling, hard working families trying to to literally carve a new world and existence for themselves out of space rock. This is the fundamental core of O’Neill’s writings – the idea of human endeavor against the inhospitable harshness of cold space – and as to why this has captured anime’s imagination so much over the decades is open to interpretation. 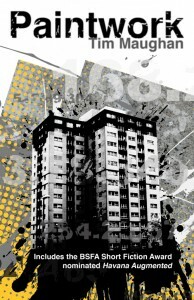 Perhaps it is something that speaks fundamentally to the Japanese identity and the desire to create new living spaces for the crowded urban masses, or ignites a cultural memory of the post war reconstruction. 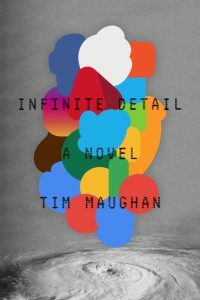 Either way, what is interesting is while O’Neill’s imagined colonies were idyllic and seemingly utopian, anime interpretations have always introduced conflict and danger – whether it is the devastation of all out war between rival nations in Gundam, or the crime-riddled backwaters of refugee cities and frontier towns in Cowboy Bebop. With MSM it is the spectre of corporate greed, as the small community is abandoned by the company men back on Earth when faced with a grave disaster. It’s this theme, coupled with the show’s gritty visuals, that gives Mighty Space Miners a surprisingly cyberpunk feel that its jaunty title betrays. In fact one of MSM’s greatest joys is to just wallow in its environmental and mechanical design; every object seems firmly solid and bolted together, lived-in and beautifully utilitarian. It’s a fantastic example of post Bladerunner and Alien science fiction realism in 90s anime, and coupled with a pragmatic approach to life in zero-gee and orbital mechanics it is an indulgent, exhilarating watch for hard SF geeks. Which leaves us with the other tragedy of this story. 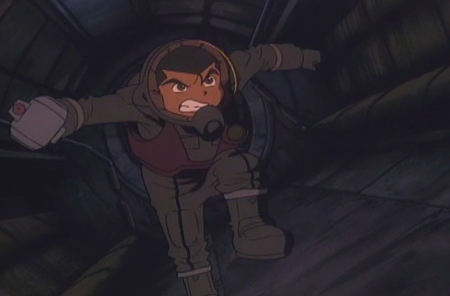 Combined with high visual and audio production values – including music from Kenji Kawai – the first two episodes of Mighty Space Miners are fantastically paced, revealing a plot that combines thoughtful suspense and tense action. This is largely driven by 12-year-old Nanbu Ushiwaka, a child protagonist that is refreshingly – for anime of this genre – headstrong and courageous instead of being plagued by existential and emotional crisis. All in all they are a near perfect two episodes – the tragedy being they are the only two episodes. Despite some extensive research I’ve not been able to find out how many episodes were planned, or even why the OVA was canceled – though my guess is bad sales, especially in light of what must of been quite a high budget – but episode two ends on a cliffhanger which is never resolved. We never know the fate of Nanbu – the only child to have survived being born in space – and his plucky family, and now with Lida so tragically gone any sense of closure seems even further away. 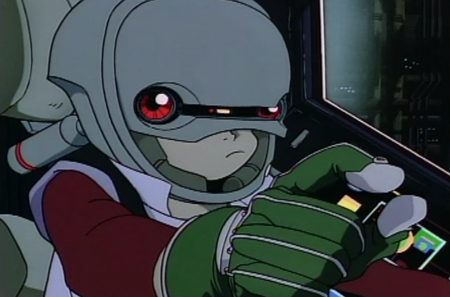 Despite this Mighty Space Miners still remains when of my most treasured – and frequently re-watched – anime works. It is hard to track down, only ever receiving a limited VHS release in the US (and as far as I know never getting a UK release at all), but you can find a digital copy if you know the places to look. And it is well worth the effort. Plus you owe it to the memory of Umanosuke Lida, who clearly put so much love and energy into its creation.